A chord is a group of notes played together to create a certain type of sound. The type of sound the chord makes depends upon the notes used in the chord. There are many diferent types of chord with Major and Minor chords being the most common. When you learn a new chord listen carefully to the sound and mood it creates. The following chord is a D Major. The horizontal lines on the diagram represent the frets with the double one at the top being the nut. The vertical lines represent the strings with the thickest on the left. The black dots tell you where to put your fingers and the numbers next to them tell you which finger to use. An “X” next to a string means dont play it and an “O” next to a string means pluck the string without fretting any notes, this is called an open string. When playing chords first of all make sure you are only plucking the strings you should be doing. Then pluck the strings one at a time starting with the thickest and make sure each note rings out clearly with no unwanted buzzing or muting. If the chord isn’t sounding right you will have to adjust your fingers and sometimes press a little bit harder. Check your fingers are only on the string they should be and are not resting on the fret wire. When you are happy the chord is correct it is time to strum the chord. Strumming means playing all the notes at virtually the same time plucking the strums using a downward sweeping motion. 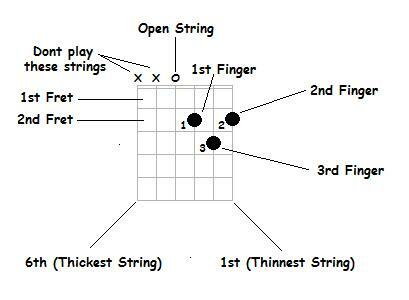 Posted on May 29, 2012, in Beginners Lessons and tagged beginners, boxes, chord, free, fret wire, guitar, how, lesson, minor chords, open string, read, to. Bookmark the permalink. 2 Comments. I’m a beginner, having bought an acoustic guitar and tried to learn major coords etc. I can’t read music but would just like to learn how to play a few songs . Please can you give me your prices for lessons… I’m thinking of booking a block ..is there any discount for this.